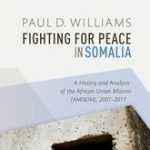 Review of: Paul D. Williams, Fighting for Peace in Somalia: A history and analysis of the African Union Mission (AMISOM), 2007-2017.
Review of: Paul D. Williams, Fighting for Peace in Somalia: A history and analysis of the African Union Mission (AMISOM), 2007-2017. Oxford University Press, 2018. The African Union Mission in Somalia (AMISOM) is the AU’s largest, most ambitious, most complex and most dangerous peace support operation. It has rivaled and often surpassed United Nations peace missions in size and challenges. Paul Williams has written a thorough, extremely detailed, comprehensive, balanced and thoughtful account of the mission. It is indispensible for any policymaker or scholar of Somalia, and a model for how academic analyses of peace operations should be written. First and most importantly, Williams has documented AMISOM. He places all of the information about AMISOM in a single volume, organized in a straightforward and lucid manner. It’s a needed task. The first part is a history: seven chapters that cover all the phases of the mission from its genesis in 2004 to the debates about its drawdown and exit in 2017. Originally envisioned as a regional operation by the InterGovernmental Authority on Development (IGAD) to support the nascent Transitional Federal Government, AMISOM truly came into being in the wake of the Ethiopian invasion of Somalia in 2006 to defeat and remove the Union of Islamic Courts and its military wing, known as Al-Shabaab. Ethiopia and its de facto client, the TFG, needed an exit strategy, and Uganda was ready to provide one, in the form of the backbone of troops for AMISOM. Burundi followed. Williams explores the motivations for each country to send its troops—a mixture of seeking international approbation, developing military capacity and standing, and getting funded. The small AU force was never, from the outset, a peacekeeping operation, but rather a war-fighting and counter-insurgency operation. In 2010-11 it was engaged in urban warfare against Al-Shabaab in Mogadishu, sustaining and inflicting casualties at a level that no UN force would have been prepared to do. In 2012 and 2013, Kenya and Ethiopia then re-entered Somalia, for their own political and security reasons, but in due course becoming formally part of AMISOM. As Williams details, however, each of the troop contributors had its own sector and conducted its own military operations under its own command, sometimes with little coordination. The stated intent was to develop the Somali National Army (SNA) as their national counterpart, to the extent that it would be able to take over responsibility for national security including defeating Al-Shabaab. The SNA has shown little potential for achieving this, hampered by the more local loyalties of its commanders, corruption, and political divisions within the Somali government. The AMISOM contingents are themselves not innocent of the SNA’s failings, as the operational priorities of having local forces with which each can work, have overruled the national priority of an integrated force with common military training, doctrines and command. All of this, Williams recounts in commendable detail, including shocking stories of the failures of logistics in the early days, leading to nutritional crisis among the AMISOM troops at their insanitary military camp in Mogadishu, and the scores of fatalities inflicted by Al-Shabaab attacks on isolated AMISOM outposts in the rural areas. The UN Support Office for AMISOM played an invaluable role, but Williams is unsparing in exposing the mismatch between the UN’s bureaucratic frameworks for providing support, and the requirements of AMISOM’s mobile war-fighting. The second part of the book covers six cross-cutting challenges: logistics; security sector reform (SSR, of the SNA and police); protecting civilians; strategic communications (media strategy for the Somalis); stabilization; and exit. Once again, Williams is thorough and balanced. The picture is one of a mission that was learning as it went, often at horrendous human cost not only to its own personnel but also to Somalis caught up in the fighting. The frameworks for analysis and policy were often hopelessly inadequate for the challenges at hand. The blueprints for SSR were designed for a situation in which a country already possessed security institutions that could be reformed, rather than a multitude of autonomous security actors with diverse origins, identities and interests, that needed first to come to some form of political accommodation before the more technical processes of institutional reform, professionalization and training could begin. Treading softly, Williams notes that the political analysis should have been brought to the fore rather than the technical prescriptions. Williams account of the haphazard and inconsistent Protection of Civilians (PoC) policy is similarly revealing. African Union officials and AMISOM commanders clearly recognized the need for a PoC policy and set of practices, but had no clear idea of how to develop one in the context of ongoing military operations, a government incapable of providing any form of security or policing in its own right, and a near-total lack of legal or technical advice. Williams concludes that it is unlikely that anything like AMISOM will ever be attempted again: it is too singular to the Somali context, too complicated and too costly (in both human and financial terms). But the lessons are well worth examining, as similar issues will arise wherever there are international efforts at armed stabilization and state-building. As Somalia—and the Horn of Africa more generally—become sucked into the militarized transactional politics of the Arabian peninsular, there are signs that multilateral peace missions will be supplanted by direct military action and marketized loyalty payments. To be specific, the United Arab Emirates and Saudi Arabia have no time for multilateral peace operations or state-building, and are dismissive of missions like AMISOM. The ascendancy of this transactional style of politics could very soon result in the AMISOM troop contributors opting instead for an Emirati-financed unilateral military assault on Al-Shabaab (perhaps using mercenaries), alongside financial sponsorship of the more amenable Somali politicians. This is the model of security that the UAE and Saudi Arabia have been implementing in Yemen. Before taking that route, the leaders of the Horn of Africa should study AMISOM, with all its strengths and weaknesses. Williams’ book is the place to start.